One story we Pagans like to tell about ourselves is that we have a balanced world view, honouring the dark as well as the light, acknowledging that both are part of life. But is this actually true? If you stop and think about it, as we move around the Wheel of the Year we seem to focus much more on celebrating the light than the dark. At Yule we celebrate the rebirth of the sun, and the fact that from now on the light will return. At Imbolc we celebrate with candles the lengthening days. At the Spring Equinox when the days and nights are once again of equal length we celebrate spring and renewal. At Beltane we celebrate the beginning of summer, and at the Summer Solstice we celebrate the sun at the height of its powers. At Lughnasadh we celebrate the grain harvest ripened by the sun at the same time that we mourn its waning power. At Autumn Equinox we note the balance between dark and light whilst celebrating the summer’s harvest. 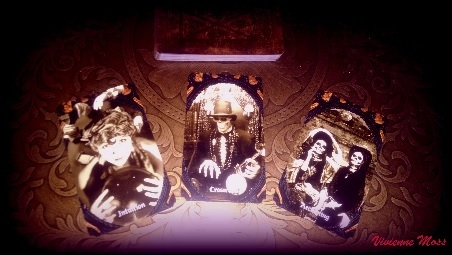 Only at Samhain do we truly honour the dark, working with our ancestors and practicing divination. So if the Wheel of the Year is divided by the Equinoxes into a dark half (when the nights are longer) and a light half (when the days are longer), why do we spend almost all our festivals honouring the power of the light and only one honouring the dark? Well it could be because the light seems a more attractive prospect. Most of us prefer warmth to cold, sunshine to gloom, summer to winter etc. But I think we are missing an important point. In focussing so heavily on the light we are not taking a balanced view. We are neglecting a large and important part of the daily and annual cycle of life, even the cycle of life and death itself. Just stop and think for a moment what life would be like if it were all light and growth and go, go, go. We need the dark of night for sleep, rest and renewal, we need shade from the heat of the sun, we need death and endings to make room for birth and newness. We need the interplay of both light and shadow to make sense of the world, to appreciate depth and perspective. Seeds, if exposed only to the sun will shrivel and dry out, never germinating. But those that fall to the ground and work into the damp darkness of the soil will eventually burst into life, sending up green shoots and drawing their sustenance not only from the sunlight on their leaves, but also from the dark richness of the earth. To be truly balanced and nourished I believe we too need to reach for the skies whilst staying firmly rooted in the ground (grounded). One part of this is acknowledging and celebrating the dark half of the year properly. Here are some suggestions for working creatively and fruitfully with the dark during this time of year. Celebrate the dark half of the year as a time for rest and renewal. Find a method of honest self-examination that works well for you, truly examine and work towards understanding your shadow self (find a good counsellor or therapist if necessary). Focus on self-care in your rituals. What would truly nourish and renew your mind, body and spirit? Do healing rituals. Give each other massages in sacred space. Share nourishing home-cooked food infused with healing spells. Focus on your dreams and what they are trying to tell you. Keep a dream journal, start a dream group, interpret each-others dreams in coven space. Use a favourite method of divination to delve deeply into your unconscious. Try fasting for 24 hours. It doesn’t have to be a food fast – you could try a media fast (turn off the TV, radio and computer, avoid newspapers, books etc) or an electricity fast (turn off everything non-essential). These are just a few suggestions to get you thinking creatively. I’m sure you can think of many more! The dark is not better than the light, the light is not better than the dark. They are equal and complementary. We need both. Let’s celebrate that. The Great Wheel has turned once again and we find ourselves at the time of the Autumnal Equinox. The air is cooler, the leaves are turning and beginning to fall from brittle branches and all of life is giving pause to prepare for what changes lay ahead. This is the second of the three harvests and the fields are already beginning to brown as the day’s light gently wanes and we are enveloped in the quickening darkness of the setting sun. It is at this time we begin to gather our stores of ripened summer foods and draw the remainders of outdoor activities into ourselves to carry us through the winter months ahead. Soon the time for introspection and the gentle quickening of the light that will be birthed at Yule will be at hand. Many will celebrate this Sabbat as Mabon and give honor to the God as the wild lord of the hunt and Green Man of the forests. The Goddess becomes Gaia, the great earth mother who offers up her lands as sacrifice in the cycle of life and death and to that, which will be prey and those that must be predator. In her form as Lady of the Beasts she will guide and protect her animals to insure that new life will come from those that survive the harshness of winter. If we look to the astronomical energies that are occurring we celebrate the space of balance between the waning light of the year and the waxing of the dark. The energy of Virgo readies itself as bridge and gateway to the opening of Libra as the transition is made from one solar month to the other. This is the action of the Mutable (Virgo) flexibility reaching out towards the Cardinal newly formed growth that is the balance of Libra. And for those moments in time when the midpoint of transfer of these energies is achieved we stand at the center of the Autumnal equinox; each being in balance with the other; equal day and equal night. One of the ways I use this turning of the Great Wheel is to reaffirm my connection to the greater world and the deeper exploration of the Anima Mundi- the World Soul. I reflect on my place in this world and on what helps to sustain that presence. I reflect on the connection that I have with all that surrounds me, and the actions that I will put into motion to strengthen and deepen that connection at all levels. Using the energy and balance of the equinox offers the space of intent that establishes a closer relationship between man and animal and the acknowledgment of the collective consciousness of the world soul that is informed by both. By definition, the Anima Mundi is considered to be the pure ethereal spirit that is contained and disseminated throughout all nature. This spirit was thought to animate all matter of the natural world in the same sense in which the soul is thought to animate the human form. If we reach back in time, our ancestors had great understanding of this premise and perceived all of life as interconnected with no separation between the human and natural world. Each was dependent upon the other for its survival and the cycles of planting and harvesting flowed smoothly and in harmony. Gaia, the goddess as Mother Earth holds within her being the essence of this animating spirit and is the sustainer of all life that is enfolded in her body. If we use the dynamics of this concept of a World Soul, we can draw on the energy of this cycle to bring about a balance of animal and man; humanity and the natural world in which we are all participants. The potential is in the opening to a wholistic state of consciousness that is inclusive of the collective awareness of all levels and streams of existence that comprise our Greater Earth. So, how do we reaffirm our connection? Being guided by an ecological conscience is a given expectation of all who consider themselves pagan and follow an earth-based spirituality. The actions that are in support of living lightly and respectfully on our planet is a commitment made because it is the right thing to do. This mindset is the beginning of making personal commitment to remain in balance with our world. We must also consider the natural world as inclusive of city streets, malls, the urban sprawl and clutter as well as the preserved forests, protected lands and spaces of wildlife and clean air. All are alive and all are part of the greater whole each having its own dynamics, rules, detriments and positives. That which we consider as polluted and over trafficked are the result of man’s creation and as such are connected to the spirit of man and therefore also that of nature. One very concrete and tangible effort is volunteering at an animal shelter. My daughter walks dogs for the local shelter and has fostered kittens. Food, blankets and carrier donations are gratefully accepted by most. Spending time in a nature preserve and observing animals in their natural habitat gives a greater sense of the beauty and complexity of exchange between nature and her inhabitants. At a spiritual level, spending some time in meditation to connect with your own power (or Totem) animal will open up other pathways of understanding. Regularly working with this animal and asking it to share its mysteries and place among all of the wild can help to guide you towards those physical steps you can take in the manifest realm. If you are so inclined, planting a garden and dedicating it as green space with emphasis on those plants that attract butterflies and birds gives sanctuary to the animals in your neighborhood. Working with medicinal herbs and plants and getting to know the energies of the Devas and land spirits will connect you more deeply with the green world. Their healing and opening properties will offer opportunity to feel the potency of their energy and listening to the wisdom of the land spirits will guide you in living in a manner that is in support of sustainability and maintenance. And, a key component to all of these is the work we do for ourselves to align and balance those parts of ourselves that act as interface for this exchange. When we work in balance with our parts of self, we are working in accord with the world around us. In order to connect with our natural world we must first find those places of connection to the wild within our selves. The Lower Self is the place of direct connection with our instinctual and basic survival nature. This is the place of the animal and of the wild that makes decision propelled by its basic needs. Those things within us that stir the desire to interact with others, to form community and to create safe haven are part of the order of the natural world. The Middle Self draws that basic instinct up to a place of balance so that the excess of these things is in agreement with our place in the world as we know and perceive it to be. It, in effect acts as the gatekeeper allowing what is productive at any given moment to be given the pass-go so we may remain effective in our work as part of a larger whole. The Higher Self is the point of connection with the Divine and the Higher mind. It is this self that streams information from the collective conscious and informs the actions that will ultimately be taken by the Middle Self. It is the connecting point of the highest levels of understanding of the unity and thread of commonality in all things and the source from which they originated. The work that we do in aligning these aspects of our true nature eventually brings us to the center point of balance and it is from this point that we find our place in the natural world as participant and guardian of the life that is contained therein. This is the space where our perceptions broaden and we sense the entirety of the world and can then be effective in all of our workings within it. I invite you to join me at this time of the Autumnal Equinox and celebration of the wild. Breathe into the space of yourself in all of your parts and then breathe out the blessed gift of your power to the Earth. I saw a crow carrying a hedgehog today. The hedgehog was dead, crushed by a car whose driver was oblivious to its small, spiky presence. Maybe that driver was in a hurry, or didn’t see, or simply didn’t care. The crow waited for a gap in the traffic, and, just a few yards in front of me, it glided smoothly down to the tarmac, grasped the sorry, squashed creature in its beak, hopped ungainly a couple of times to catch its balance and flew on to the railing separating road from grass verge. Nature’s cleaners, I thought. It immediately struck me that this wouldn’t be everyone’s reaction. Probably more like gross or something along those lines. But without carrion eaters, our roadsides would be a mess of maggots and rot. Mind you, even the maggots ensure there is less decaying meat hanging about and making the countryside smell bad. Autumn is all about dying. In the wheel of the year, winter is often named as the season of death, but autumn is where it all starts. The leaves fall in a shower of spectacular beauty, but the colours soon fade and crumble into a crust of browns and blacks. The day becomes shorter; a hunched, elderly shadow of its former glory. Fungi spring forth everywhere, their mycelium eating away at their hosts. Even the fruit still clinging to brambles, hawthorns, elders and rowan trees reminds us that the season of plenty is coming to an end; these are the last pickings of the year. Best grab them while you can. So of course, as a witch, I tend to listen to nature. I grab: I take my young son out after school, and we pick rowan berries and the last of the blackberries, some stubborn crab apples and even a few sloes. We bask in the golden, autumn evening, and we talk about how different the woods will look soon, when the leaves have all left, and the trees are skeletal shapes haunting a frosty cemetery. Nathan doesn’t shy from asking about death, and I’m glad about this. His lack of awkwardness makes it easier for me to be open with him, so we talk about the season dying in the same tone that we sometime talk about our own mortality. I wonder if it’s odd for a six year old to be asking about death, but he often asks me how long I’m going to live for, and when I will die, and he talks about his own death in quite a matter-of-fact manner too. I try and match this attitude by not couching death in different terms; if something is dead, it is dead. It’s not ‘passed’ or ‘sleeping’. Life is confusing enough, and its ending is both fascinating and terrifying. No need to make it more confusing than it already! He often asks about my ancestors and when they died (When did your great-nanna die mummy? How did she die? How old was she?) and although the only deaths he has experienced are of beloved pets, he seems to both understand the concept and be incredibly ready to speak about it, including articulating the different ways he feels; sad, puzzled, intrigued and at times unsure. I think this is something we lose as we grow older: the ability to see death as a part of life, albeit a puzzling and often devastating part. Perhaps it is the devastation that makes us shy from discussing it, but wouldn’t it be easier if we could reach out to someone and say exactly how we felt, without feeling awkward or clumsy about it? These seem like deep thoughts to have come from a poor, flattened hedgehog! But I often find myself reflective around the autumn equinox. Day equals night in a point of both balance and liminal potentiality. We are not quite into the chills of later autumn but we certainly can’t call it summer any more. There is death on the horizon, the death of the season and, eventually, the eternal promise of the return of the sun and the longer days. There is also the promise of the darkness; of rest, rejuvenation, and time to oneself. The promise of cold, white mornings and mysterious mists. The whisper of snow in the distant weeks. I don’t always crave the light, the sun and the heat. Sometimes I like to feel the touch of ice, like the crooking of a skeletal finger, to remind me that I am alive, and I feel all things: happy and sad, joyful and angry; energetic and lazy. I am whole, yet flawed, broken even… and that’s OK.
Summer dies, and that’s OK too. I miss the long, luscious days but I crave the long, cosy nights. I can be safe in my home, by my hearth, watching the world outside die slowly or move into hibernation. And the crows… well they are there all year round, clearing up the corpses and tidying the entrails away. I have my own crows that pick up the rotten bits in my mind and carry them away. They aren’t always active, but when they are, I am grateful. Hail to the carrion eaters, reminding us, like our children, that death is a part of life and when it gets messy, there is always someone who will enjoy the gloppy bits. The Great Wheel turned once again and just a few weeks ago we found ourselves at the place of the Autumnal Equinox. Each Sabbat flows in process of energy, one to the other. What and how we choose to celebrate and honor these turnings of the Great Wheel has both subtle and overt impact on how we navigate the days and months following. It is with this intention that I offer this writing and reflection on a Sabbat of balance and the gift of exploration of the Light within the dark spaces of quiet and surrender. The Equinoxes astronomically mark a point when the North and South poles of the Earth are neither tilted away nor towards the Sun. Twice yearly, this event means that both hemispheres are in receipt of equal amounts of day or night respectively. In the Northern Hemisphere the air is cooler, the leaves are turning and beginning to fall from brittle branches and all of life is giving pause to prepare for what changes lay ahead. This is the second of the three harvests and the fields are already beginning to brown as the day’s light gently wanes and we are enveloped in the quickening darkness of the setting sun. In a few more weeks the silence of Samhain’s energy will issue call to the Ancestors and their wisdom. But, for now we must lay the foundations upon which we will stand as we reach deeper into the waning year’s shrouded light. In the Southern Hemisphere the September Equinox marks the time of Spring’s advent and the anticipation of warmer weather, the Waxing of Father Sun’s light and the growing of new earth towards a state of fullness at during the Summer Solstice. The point of interest here lay in the state of balance that occurs at this turn of the Wheel; one preparing for darkness and the other anticipating brilliance of light. And, for this space of time neither holds more power than the other. It is at this time that we can stand in the neutrality of both expressions of our own light taking from each what is needed. The Sabbat of Lammas heralded the first stage of work required to begin the harvest and followed through with action taken to reap and preserve what would sustain life. As we celebrate the Autumnal Equinox, we are now at the mid-point, the second harvest, and the space of integration and pause to fully acknowledge and look more closely at what we have brought into our storehouse. The Autumn Equinox holds the promise of offering the space of equilateral time to assess and prepare for the next wave of descent into a darker and deeper space of introspection and transformation that will occur at the third and final Harvest of Samhain. Many will celebrate this Sabbat as Mabon and give honor to the God as the Green Man of the forests. The balance of light and dark plays out in the actions that support survival of the fittest in all of their forms; human and animal. In this cycle of the God and Goddess, the Goddess mourns the loss of her consort, the God. The sacrifice He has made in the First Harvest prepares the way for the re-birthing of His light at Yule. The God now stands as the Green Lord of the Wild Hunt and serves to protect the animal world. His offer of sacrifice now is one of the animal world; insuring that all are slain with sacred reverence for the life given and that no meat is wasted. The Goddess shifts her vision and becomes both the holder of the seed of the God’s light she will birth at the Solstice and the barren Crone whose wisdom has seen the return of all the cycles, year after year. As Gaia, the great earth mother she offers up her lands as sacrifice in the cycle of life and death and to that, which will be prey and those that must be predator. In her form as Lady of the Beasts she will guide and protect her animals to insure that new life will come from those that survive the harshness of winter. In her other guise as the Crone, the withering and drying of her youth and the turning within is reflected in the drying of the grasses and the falling of the leaves. Hers is the space of soon to come death that will hold the mystery of renewal and rebirth. As we move through this turning of the Great Wheel and its cycle of change, the light has begun to dwindle in outward expression in the physical world and the call to tend to the fires within and the heart (h) of promise that awaits our cycle of inner retreat and silent sanctuary is amplified as light and dark share equal space of action. This, the second of the three harvests concerns itself with the sacrifice of animal life and in those actions we affirm a deeper connection and reverence for what will be slain.? This is the continuation of the work towards integration that was begun at the First Harvest of Lammas. As the waning light of day gives way to the waxing darkness of night, if we have used this time wisely and productively, we have been readied to stoke the light held within as darkness holds sway. The last light of the setting Sun signals the change that is at hand and the momentary poise of balance that this day has held shifts carrying us into the transformative Light held in the darkness. The energy of this Sabbat could be equated with that of Sunset in the Solar Cycle. The air is becoming cooler and the instinct to withdraw into the comfort of hearth fire and home comes to the foreground. Life is slowing all around us, and nature is taking its cue from the universal cycles of light and dark as plant life goes dormant and leaves fall. The animal world offers up sacrifice of its life’s energy to feed and sustain the humans as stores of meat and game are carefully prepared to last throughout the winter months ahead. In the wisdom of the season, predator now becomes prey and what is too weak to survive will fade into the blackness of night’s eternal sleep. Father Sun’s light is dwindling in length of day and the heat that was intense and filled our cells strongly is now diminished and works at the subtle levels in the shortened time allotted. This place of balance speaks not of the light of God and Goddess, but of the Light that is tended and offered up willingly that we as their Divine progeny carry within. Despite the busy-ness of our daily efforts and the throngs of people who surround us, the call of the Hermit resounds loudly, reminding us of the need to rest in his Light of renewal. This is not the need to retreat into solitary existence; rather the need to balance or outward activities and give due honor to the need for contemplation and introspection. The Hermit offers the respite of time to move inward in contemplation and foster communication with the Higher Self. His Lantern carries the spark of the Divine flame that is the light shining eternally within our being. Within this inner scape of muted light and silence we are called to a place of accountability. Just as the rewards of the Harvest must be tended and monitored to ensure they last, so too what we have reaped in the full light of the Waxing of the Year and gathered as our harvest must be accounted for, nurtured and safe-guarded. The balance of day and night that is held at the time of the Equinox provides the space of action bridged by the pause of rest to reflect. This is the lesson of the Hermit as the Light of the Autumnal Equinox and the call to heed well the need for moving into the darkness of soul’s intent before movement into light and balance may be achieved. The days grow cooler and the nights draw closer as an air of mystery blankets the land. 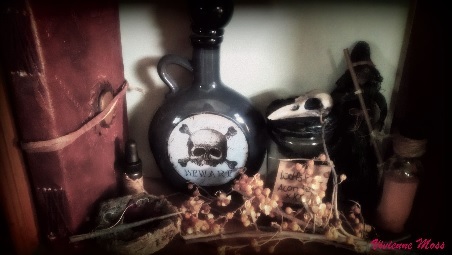 As Autumn approaches the Season of the Witch begins. The scents and sights of decay delight the senses of the macabre minded, and the colorful splash of red, gold, and orange bring warmth to the shadowed landscape. This is the time I feel more alive and closer to the Lands Enchanted. I welcome the uncanny feel of bewitchment as I ready myself for the mischief and mayhem the Spirits of Shades and Shadows bring. The soulfulness of the Enchanted Realm of the Dead awaken my mind to the mysteries that dwell beyond the Veil—beyond the Gates of Hekate. Communication with our Beloved Dead become easier as the Gates are swung open and the veil becomes thinner. For me, the Dark half of the year begins in the Fall, when the nights grow longer and a certain chill is in the air. The Dead start to stir, and the Dark Fae of the Shadow-Lands come into full power. This lasts until Spring, when the Shining Ones awaken, blanketing the land in light and the pastel colors of newly born flowers paint the Earth in splendid delight. My home reflects the changing of the seasons, my altars taking on the visage of light or dark—Seelie or Un-Seelie. Being a Hedge and Cottage Witch means being in tune with Nature and Her Spirits, learning to understand the ever changing tides of time. I walk the crooked, gray path of Witchcraft, communing with those Unseen, both dark and light. I embrace that which is within, accepting my dark and light self. As I prepare myself for the encroaching darkness, I consult with my Beloved Dead and the Spirits of the Shadow-Lands who have made themselves known to me. I ask them for protection and insight, listening keenly for all they impart to me. I ward my home against malicious spirits and pay homage to those Spirits who have been charged to protect my home and my loved ones. I have found Red Brick Dust and my own home made Holy Water (sacred water consecrated on the Altar of Hekate) to work wonderfully in the warding and protecting of my home. When the wards are set and my Spirits thanked I am able to sit back and enjoy my favorite seasons, Fall and Winter. I prepare my home for celebrations and merriment and make plans for our annual visit to the Pumpkin Patch—(Sadly, I need to find a new one to visit. Our favorite one closed last year.) With birthdays, Halloween, Thanksgiving, and Yule all coming one right after the other, I have plenty to celebrate and look forward to time spent with loved ones. Parties, bon-fires, hayrides, baking and much more are what I love about this time of year and why I embrace the darkness that comes with it.